Maintaining a standard of excellence that establishes The Probabilistic Method as the leading reference on probabilistic methods in combinatorics, the Fourth Edition continues to feature a clear writing style, illustrative examples, and illuminating exercises. The new edition includes numerous updates to reflect the most recent developments and advances in discrete mathematics and the connections to other areas in mathematics, theoretical computer science, and statistical physics. 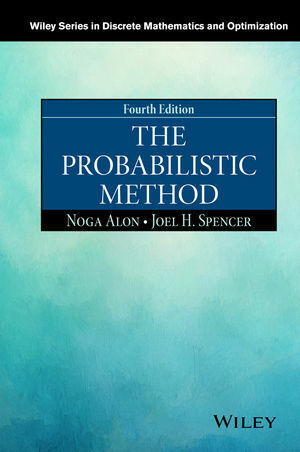 The Probabilistic Method, Fourth Edition is an ideal textbook for upper-undergraduate and graduate-level students majoring in mathematics, computer science, operations research, and statistics. The Fourth Edition is also an excellent reference for researchers and combinatorists who use probabilistic methods, discrete mathematics, and number theory. Noga Alon, PhD, is Baumritter Professor of Mathematics and Computer Science at Tel Aviv University. He is a member of the Israel National Academy of Sciences and Academia Europaea. A coeditor of the journal Random Structures and Algorithms, Dr. Alon is the recipient of the Polya Prize, The Gödel Prize, The Israel Prize, and the EMET Prize. Joel H. Spencer, PhD, is Professor of Mathematics and Computer Science at the Courant Institute of New York University. He is the cofounder and coeditor of the journal Random Structures and Algorithms and is a Sloane Foundation Fellow. Dr. Spencer has written more than 200 published articles and is the coauthor of Ramsey Theory, Second Edition, also published by Wiley.